A creative way to send flowers they’ll absolutely love – in gourmet milk chocolate!! 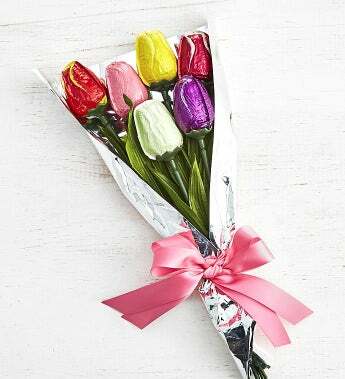 Welcome Spring with this delightful bouquet of spring tulips molded in chocolate and foil wrapped in lovely spring colors. Six delicious flowers are wrapped together and tied with a beautiful pink satin ribbon. These flowers taste so good, they won’t last long!